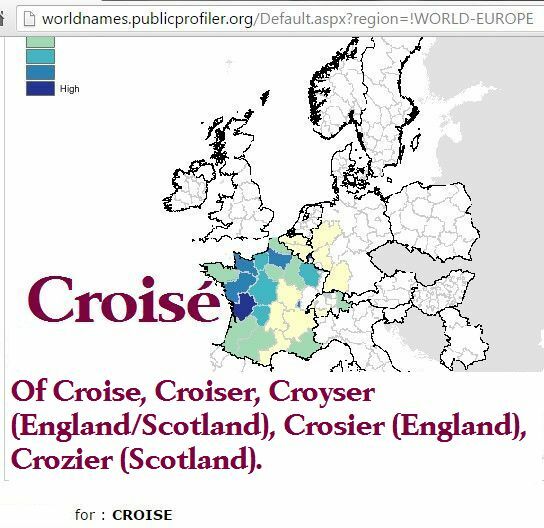 Crozier, Crosier, Grozier, Gros, Crosser, Cross, Cros, Crozat, Crozet and other variant names. 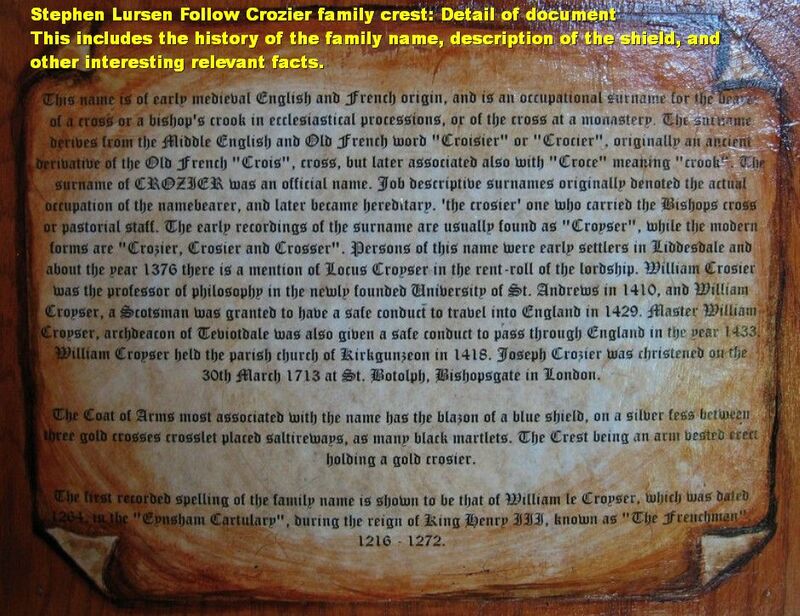 Surnames (Family Tree DNA Crozier site) Crazier, Crizer, Crosair, Crosare, Croser, Crosier, Crosir, Crosnier, Crossar, Crosser, Croysar, Croyser, Crozer, Crozier. Crozier Clan is an ally of Clan Armstrong, Nixon, and Ellot. Though by the by the sixteenth century Crosier/Crozier (cross/sheepherder’s cane bearer) . 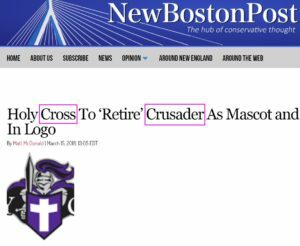 At that time the name meant cross sier or cross/cane bearer. Though the origins and spelling of the name in Scotland in 1376 is Croyser, indicating in the Scottish language of Croyland (hut land), as Croyser (hut people). Note as near Croyland the surname Alan variant is used. It should be noted, Hobbs Elwode (Hob Elwald; Robert Elwald-Ellot), Clemyt (Clemyt Crossier, Clement Crosir’s sister’s son, in other words his nephew, better known as Clementis Hobs of Stobs/Gorrenberry). 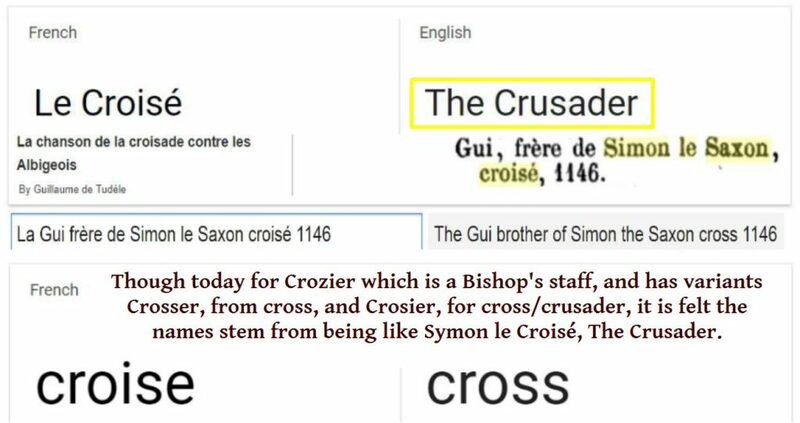 Croyser, Croiser, and latter it is felt Crosyer, and Crosier all refer to Cross. 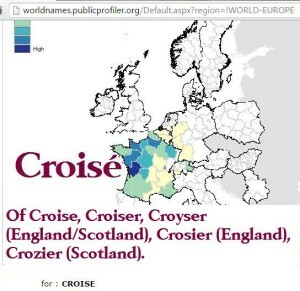 As one can see above most early spellings of the name are Croyser (Croiser). 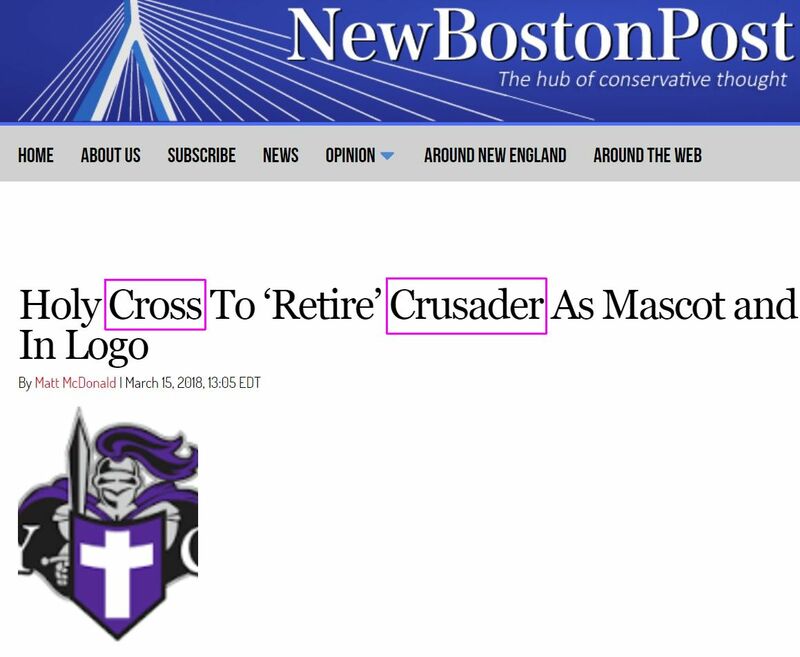 Definition is basically cross given the definitions of croys/crois, in reference to cross goes back likely to the twelfth century, previous to its common use as a surname, so this lends me to believe that when the surname was adopted by the Scottish or to become Scottish group, the name meant cross. 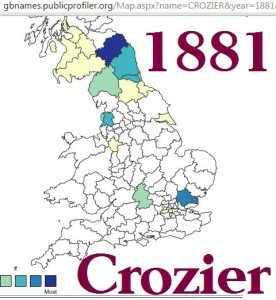 Name Croyser of 1376 becomes Crosyer of 1541. 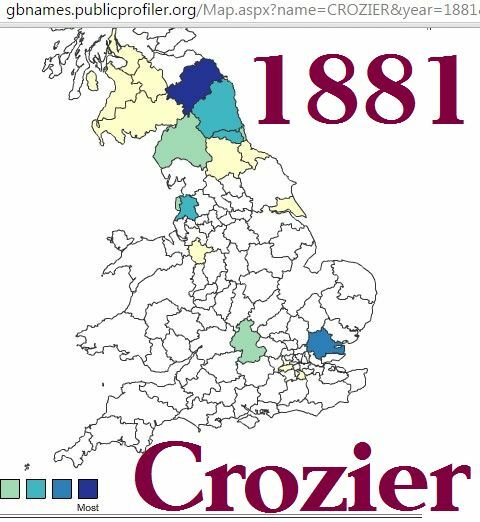 It is felt that the name Crozier has dual origins one of the French-Norman Crosier, and the other of the Scandinavian-Scottish Croyser with both eventually become Crozier. The name Elliot has dual surname origins of the Norman Aliot, and the Scandinavian Scottish Ellot. People of the Scandinavian Scottish name origins of Croyser, lived among the Ellot in Liddesdale. The Ellwood, of Elwald/Elwold, to Ellot to Elliot, in the borderlands, are in close relation to the Croyser/Crosyer. The Elliott, and Crozier, today have dual identities of French Norman and Scandinavian. Today the Crozier are a sept of the predominately Scandinavian Armstrong. Croyland the land of huts and Croysers, those who lived in and built the huts. Note; stag head at crest. With the Elliott there are basically dual origins in the Crozier. With Elliott, the UK Elliott (not Elliot) are likely to be of Norman origins of William de Aliot (Eliot) of Southern, France, and not a sept of Clan Elliot, an example would be TS Eliot. Many of the Crozier, have a similar distribution to the Elliott, and are related to the Elliott, through Scottish/Scandinavian origins, and these are the sept of Clan Armstrong. Today the UK Clan Elliot does not seem to recognize the Elwald line which is strongly connected to Clan Armstong, so am asking Clan Armstrong to recognize the Elwald line of on of their septs. 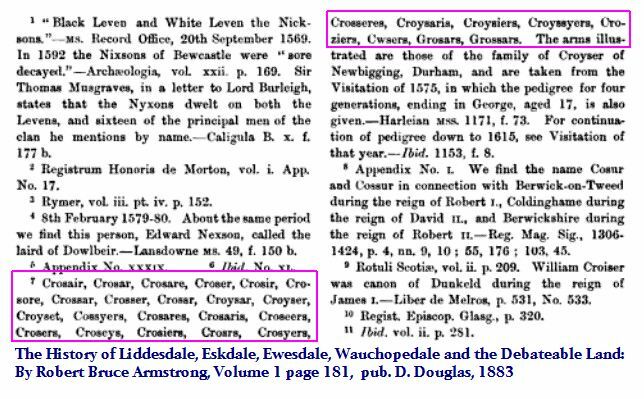 The following show that the Armstrong, Elwald (Elliot), Croyser (Scottish Crozier), are of a similar grouping. Shows numbers of Armestrong (can see why the Amstrongs are referred to as an army strong, a strong army at the time) Ellwood (English ell (measurement of length, wood (woods), like an acre forest but measure in length instead of area) (Ellot), and Nixons. 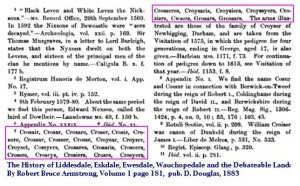 Numbers of Liddesdale, though from Liddesdale in 1376, most people of the Croyser are felt to be in Treviotdale in 1547. It should be noted that the Armestrongs, are about four times the numbers of the Ellwoods, and the Ellwood about twice the Nixons, making the army strang Armystrand along the Liddel Water the strongest army dealing with the Debatable, lands and the western border. The army of the fort the Elwald for the Hermitage Castle are as Elliot today, in the Parish of Castleton (after Old Castleton, just east of the Liddel Castle), are still strong in numbers. It is felt that the name Elwald was seeded, and surname adoption of most Elliot in Castleton Parish and Hawick, were adopted in the region. The Armystrand, became Armestrang which became Armstrong, along the Liddel and the Liddel/Liddell along the Liddel like Eric Liddell of Scotland refusing the prince of wale to run on Sunday during the 1924 Olympics in France (Chariots of Fire), was a family of the borders, and refusing aristocracy is a typical trait of a boarder. The Armstrong and Littles still today reside in the region, and in the past previous to the shield with the strong arm, used a shield of St Andrews Cross a star and crescent moon similar to the Scott shield. 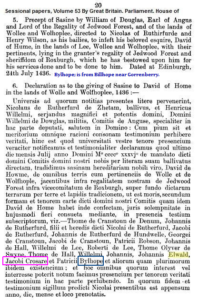 John Elwald rector of St Andrews University 1418, the provost was Bothwell (surname Douglas). 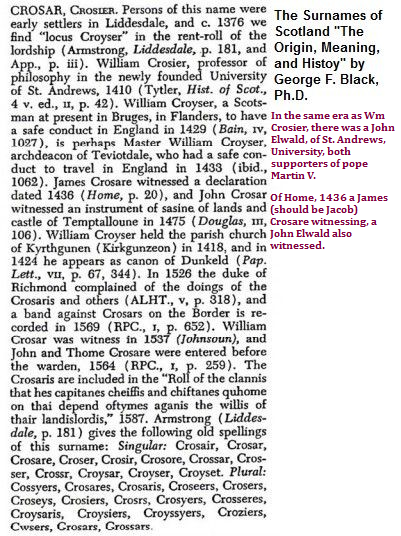 William Croyser, Archdeacon of Treviotdale, is spelled correctly in 1400 as Croyser. 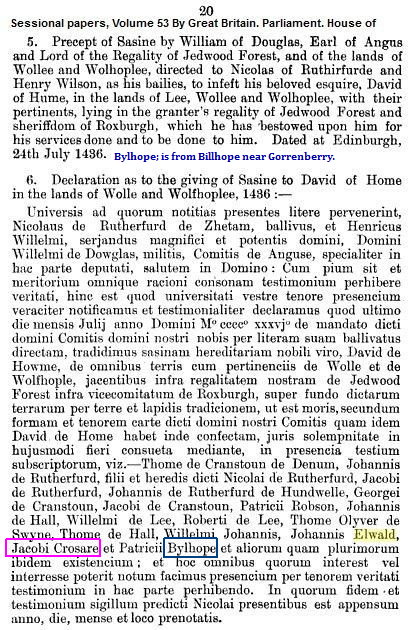 When Robert Elwald of Redheugh received the lands of Redheugh, Lariston, Hartsgarth and others, the names Ninian Elwald, and Andrew Elwald appear, likely influenced by John Elwald rector of St Andrews University 1418, and rector of Kirkandrews (church of St Andrews near Canonbie). Also in the witnessing of the deed are found the names John and Quentin Crosar. In Liddesdale there was a valley identified by the locality of those people who were called Croyser, the conclusion that in 1376 they had a surname of Croyser could be incorrect, but people who lived in this particular valley in Liddesdale were referred to as Croyser, and the valley was identified in with the location these people lived. This makes me feel that the people who lived in a built huts which were called Croyser lived in this valley. Lincoln is a city in England and should not get confused with the county of Lincoln in which Croyland is. Stag head likely from King/St Elfwald/Elwald of Hexam Abby, Northumberland. Coin/sceat minted in the capital of Northumbria, in the town/city of York, in Yorkshire. The above crest is of William of Gorrenberry/Horsleyhill, the Redheugh Elwald/Elwand line adopted and elwand on their been at the time of infeft, receiving land, and William of Gorrenberry assisted in this land receiving of Redheugh, Lariston and Hartsgarth, which uses the Redheugh shield. The elwand for the people called Elwand (Elwald) on the been of the Stobs/Redheugh shield and used for the lands of Redheugh, which Gorrenberry is of the lands of William of Gorrenberry/Horsleyhill, and retained the earlier shield without replacing it with an elwand. Showing strength in the region of Wm Le Gros (Cros), which built the first Castle at Scarborough. 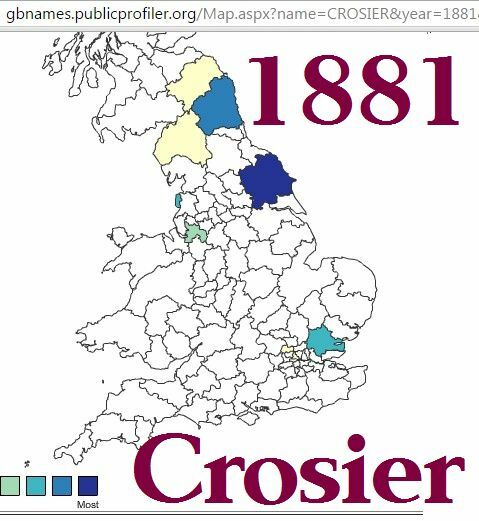 Crosier is showing in the UK and Liddesdale-Treviotdale; Roxburghshire distribution, of Scotland, along with a West Riding Yorkshire, distribution, of Northumbria, now Lancashire, England. 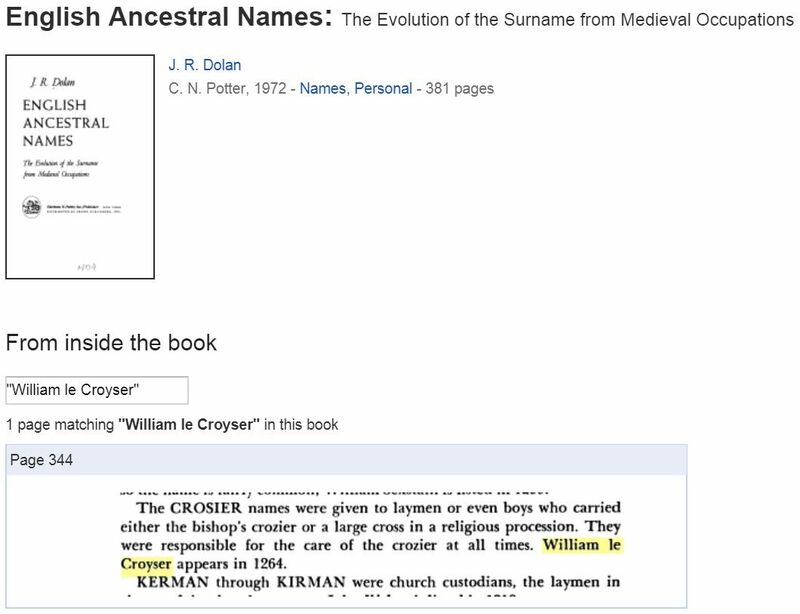 Then name Crosyer, is listed by the name preceding the above names and felt to be properly spelled for many years that of Croyser is not listed. 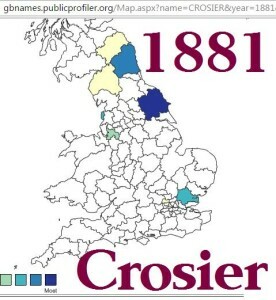 It is felt that the Croyser which changed their spelling by switching the places of the “y”&”s” to the French Crosyer, are not to be considered French, but of the same people which made up the border Scots, and Irish, of Germanic Scandinavian origin. In about 1650 when the name Ellot inserted and “i” to becomeElliot, it also became of French Norman origin, of Wm de Aliot (Eliot like TS Eliot) of southern France. 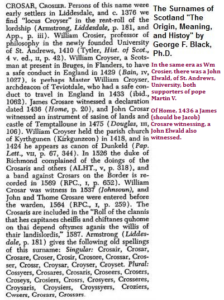 Refer to; above correction shows the Scottish croys/crois, back to the twelfth century pre surname basically meantcross. 7/26/2015. Liddesdale 1516 Croyser (Crosyer, Crosier, Crozier), and Elwald (Ellot, Elliot) and Nykson (Nixon).